The primary danger during the eruption at Merapi Volcano has been pyroclastic flows. 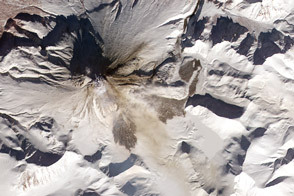 These avalanches of hot volcanic gases, ash, and rocks descend rapidly and violently, occasionally at speeds over 150 kilometers (90 miles) per hour. Pyroclastic flows are usually channeled by the terrain, but large and violent flows can spread over a wide area. 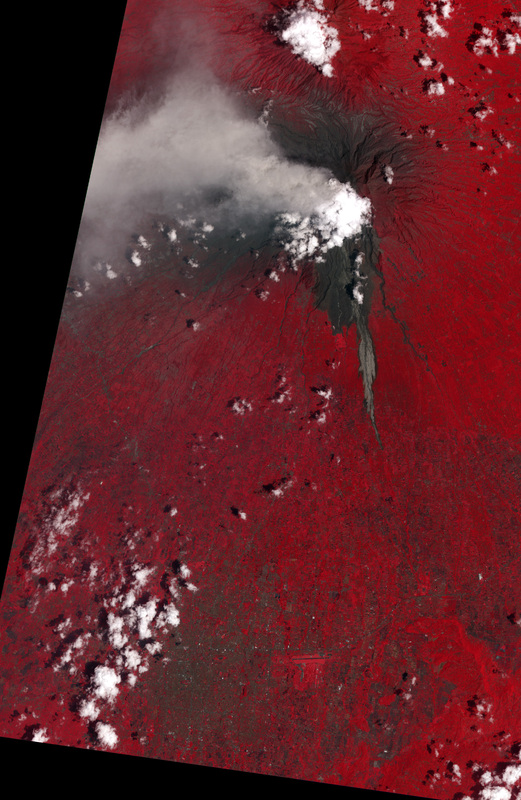 This false-color satellite image from the ASTER instrument on NASA's Terra satellite shows evidence of a large pyroclastic flow along the Gendol River south of Mount Merapi. Light gray volcanic deposits (either from pyroclastic flows or lahars) fill the course of the Gendol. Just north of the Merapi Golf Course (light red feature) is a much wider area where a pyroclastic flow spread across the landscape, causing almost total devastation. Within this dark gray area, most of the trees were knocked down and the ground was coated by ash and rock. The flow deposits are largely surrounded by healthy vegetation, colored bright red. A light gray ash plume extends the west of the volcano, guided by the prevailing winds. Near the plume, heavy ashfall has coated the fields and forests, coloring them dull red to gray. Image courtesy NASA/GSFC/METI/ERSDAC/JAROS, and the U.S./Japan ASTER Science Team. Caption by Robert Simmon. 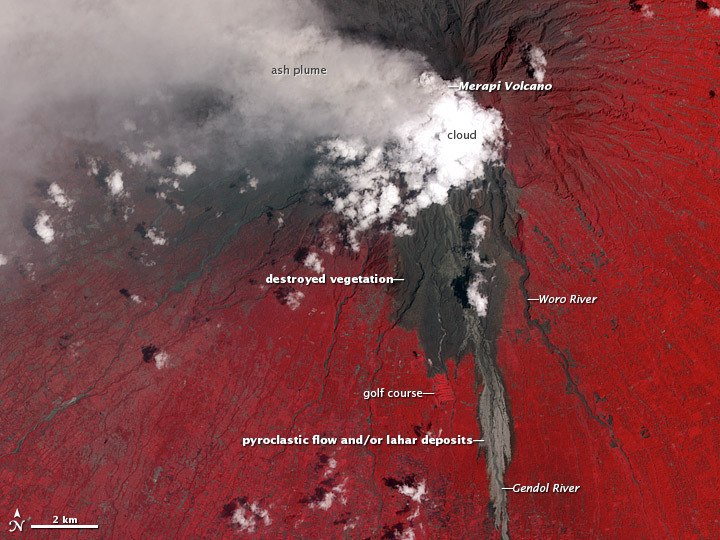 Satellite image of the scars left behind by hot volcanic avalanches from Merapi Volcano, Indonesia. On October 26, 2010, Mount Merapi began a series of deadly eruptions that lasted into November. Digital Globe. (2010, November). Mount Merapi, Indonesia. Accessed November 15, 2010. USGS. (n.d.) Pyroclastic Flows and Pyroclastic Surges. Accessed November 15, 2010.